A short interview with James Tait of Canonical. Hosted by corenominal on 2014-10-20 is flagged as Explicit and is released under a CC-BY-SA license. In today's show, Philip Newborough interviews James Tait of Canonical, the company behind Ubuntu. James talks about his work on the now defunct Ubuntu One project, and his current work with Ubuntu Phone. James is a super-nice guy, knowledgeable and very gracious. He was a pleasure to interview. 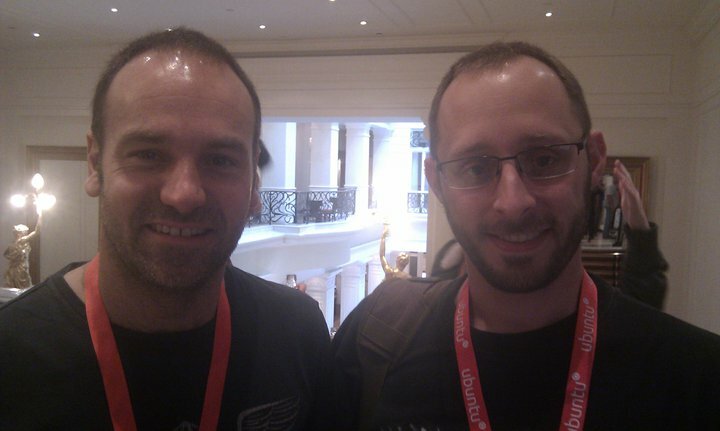 PICTURED: James Tait (right) with Mark Shuttleworth (left). The interview was conducted at OggCamp 14, a free culture unconference, held in Oxford UK on the weekend of October 4th-5th 2014.